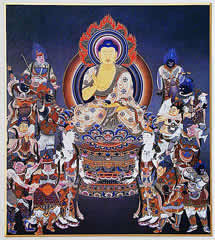 The 12 Heavenly Generals protect and serve the Yakushi Nyorai (the Medicine Buddha). 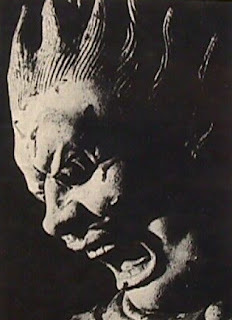 They are also known as the Juuni Yakusha Taishou 十二薬叉大将, or Juuni Shinnou 十二神王. 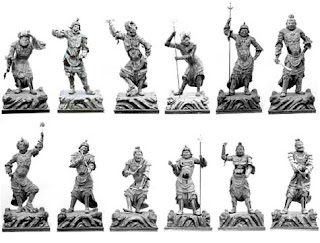 The 12 are Hindu Yasha 夜叉 who were later incorporated into Buddhism as protective warriors. 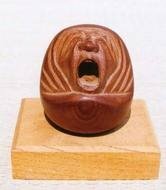 In Japanese sculpture and art, they are almost always grouped in a protective circle around the Yakushi Nyorai -- they are rarely shown independently. Many say they represent the twelve vows of Yakushi; others say the 12 were present when the historical Buddha introduced the "Healing Sutra;" yet others that they offer protection during the 12 daylight hours, or that they represent the 12 months and 12 cosmic directions, or the 12 animals of the 12-year Chinese zodiac. The Juni Shinsho are also members of the Tenbu (Sanskrit: Deva), a larger grouping of deities protecting the Buddhist realm. Each of them represents one heavenly direction and one of the twelve hours of the day and twelve months of a year. Time and space are one in their presence.
. basara ばさら / 婆娑羅 flamboyant elegance . Auch "12 Dämonen-Generale" (Juuni Yasha Taishoo) genannt. Inkarnationen der 12 großen Gelübde des Yakushi Nyorai. Sie gebieten jeder über 7000 Gefolgsleute, zusammen also 84 Tausend, um die 84 Tausend Leiden der Menschen durch Erleuchtung zu wandeln. Umgeben immer eine Statue des Yakushi Nyorai. Man ordnet ihnen auch die 12 Tierzeichen, die 12 Doppelstunden eines Tages und die 12 Himmelsrichtungen zu. Ihre Namen enthalten die 12 Tierzeichen. Jedem General entspricht auch ein Bosatsu und ein Nyorai. Mit flammendend abstehendem Haar, in dem das entsprechende Tierzeichen dargestellt ist. Furchterregender Gesichtsausdruck und dynamische Gebärden. Rüstung oder Waffen im chinesischen Stil, mit Schwert, Hellebarde u.a. Besonders bekannt sind die Lehm-Statuen im Tempel Shin Yakushiji, Nara. Drachen. (Schaf.) Pfeil und Bogen. In einem früheren Leben war er ein menschenfressendes Krokodil im Indus; wurde später bekehrt und zu einer schützenden Meeresgottheit. In Japan besonders im Kotohira-Schrein in der Konpira-Halle in Shikoku verehrt. Siehe auch Bishamonten. Hase. (Affe.) Axt in der linken Hand. Vogel. (Tiger.) Einzackiger Donnerkeil. Oder Axt in der rechten Hand. - Classified as Important Cultural Property of Japan. (1) To illuminate countless realms with his radiance, enabling anyone to become a Buddha just like him. (2) To awaken the minds of sentient beings through his light of lapis lazuli. (3) To provide the sentient beings with whatever material needs they require. (4) To correct heretical views and inspire beings toward the path of the Bodhisattva. 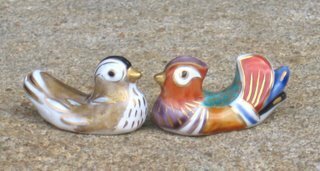 (5) To help beings follow the Moral Precepts, even if they failed before. (6) To heal beings born with deformities, illness or other physical sufferings. (7) To help relieve the destitute and the sick. (8) To help women who wish to be reborn as men achieve their desired rebirth. (9) To help heal mental afflictions and delusions. (10) To help the oppressed be free from suffering. (11) To relieve those who suffer from terrible hunger and thirst. (12) To help clothe those who are destitute and suffering from cold and mosquitoes.